#44: Many People Ask - Why do sharks have so many teeth? But why do sharks have so many teeth? Sharks and rays are elasmobranches, or cartilaginous fishes. This means unlike us or any of the other fish that live in the Giant Ocean Tank, their skeleton is made out of cartilage not bone. Therefore shark's teeth are not anchored in bone but instead loosely embedded in their gums above their jaws. Not being anchored in bone means a shark's tooth can fall out very easily. When a tooth falls out it is replaced with another tooth from a row of teeth behind it, in a conveyor belt fashion. Depending on the species 3-15 rows of teeth can be visible! One shark can produce thousands teeth in its lifetime! Our sharks in the GOT are no exception; they often loose their teeth, and we will find them around the tank. Here are a few pictures of some of our trophy teeth. Even though it may look quite scary it is important that the sharks have so many rows of teeth, if they lost most of their teeth they wouldn't be able to feed which is very problematic since they don't make dentures for sharks. All 47 boxes of fish arrived safe and sound in Boston. We picked our cargo up at the airport and headed directly to the Aquarium. Our transport truck was backed up to the to the loading dock. And a team of Aquarium staff and volunteers quickly got to work unpacking the fish. Boxes were opened and each bag was inspected. We made sure every fish looked healthy (they looked great) and identified them by species. Thanks to all the fast "runners" on the Boston-based team, the fish were acclimating in their new tanks within minutes. Some even started eating right away--always a good sign. We'd also like to say a big thank you to the Aquarium members who helped collect such amazing specimens and also sponsored the expedition. 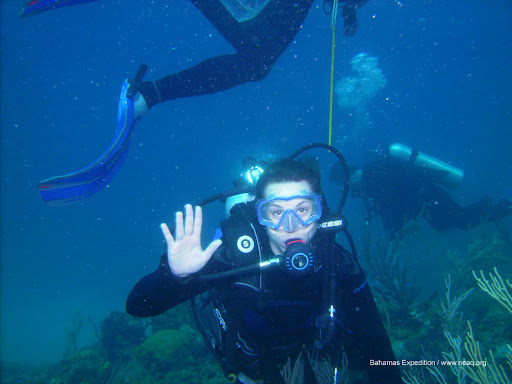 Aquarium members make these trips not only successful, but possible. We couldn't do it without their support! P.S. Want to get involved? Become a member of the New England Aquarium today! I'm sorry for not posting a blog last night. We took the RIB (the red inflatable boat) into town to have a good time because it was on our list of things to do. We ran a WILDLY successful education program for the Bimini school. We invited students and teachers to come onto the boat and learn about the Aquarium's collecting trips. About 30 kids and 4 teachers came and participated in 4 education activities. We relied on our aquarist staff and participants to lead the different activities, and everyone rocked it. Chris and Don rocked. They had the kids completely engaged, leaning over the platforms to observe the fishes different behaviors, using an aquascope to get a closer look at their shapes and colors and helping to feed the fish their last meal before they were shipped. I think the coolest part was that the kids were sharing their own names and stories of the fish we collected. One of our commenters wanted to know if you can eat black durgon (mom). Apparently you can and according to one student they are delicious! But before you run to the store to pick it up, check the Aquarium's sustainable seafood list to see if it's a good seafood choice. Expedition members Jeremy and Susan had the students picking up and identifying different adaptations these little creatures have. Jeremy was a natural, acting out different behaviors and encouraging them to pick up and touch the animals. Susan, a gynecologist, had a chance to mentor a student who wants to become a gynecologist. Biologist Sherrie and team member Russ threw themselves into the activity, they were both down on the ground demonstrating the process, and surely keeping the kids entertained on the process. They also encouraged students to think critically about the challenges and problem solving associated with catching fish for our exhibits. I ran this activity with expedition team member Scott, and was so impressed with how bright these students were. 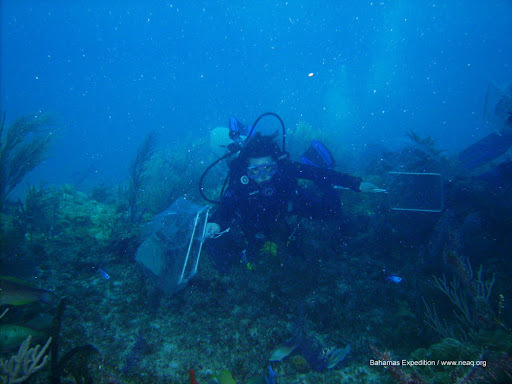 They had done a unit on invasive plant species and were able to apply what they had already learned to the invasive lionfish now found in the Bahamas. Scott jumped in to run the last group by himself so that I could roam around and observe the other activities. He told me that the kids asked what the lionfish's natural predators are in the Pacific, and he didn't know the answer so he said "Dragons." I'm still not entirely sure if he was joking or not. We sent them off with "Live Blue" Aquarium hats (you can see the "Live Blue" t-shirts here) and an I.D. Booklet of all the fish we were hoping to collect. In return one student thanked us on behalf of her school, and we all, even Russ, teared up a bit. Now I need to take a minute to try and right something. After the program we walked around town and ran into Marie, an aspiring Marine Biologist. I invited her to come check out the boat and all the animals we collected. Just as we were pulling away from the dock she showed up with her family and we missed them. It was the most disappointing part of the trip for me, to let this young lady down, so ... Marie from Ontario, if you're reading this, I'm so sorry we missed you, and please email me. By the way, the night dive I mentioned in this post was awesome. I was so focused on keeping my partners work area lit, without crashing into them, that my imagination couldn't run wild and I didn't freak out. I was pretending to turn Deb's air off before she jumped in the water. Huge shout out to Don for trying to repair my salty power cord and to Russ for supplying me with an alternate power source. We swam with dolphins today. They were curious, swimming under and around us, and when they were bored with us, which was long before we would have been bored with them, they just took off. You could hear all the clicking sounds they make to communicate with each other. Maybe they were commenting on how incredibly clumsy we were in the water. I felt like such an awkward doofous next to them. Sherrie was beside herself, and is now enduring the jokes we've been making about her technique of holding her hands behind her back to "look more like them." We can joke all we want, but the dolphins did come the closest to Sherrie. 1. We were not looking for dolphins. We noticed them playing on the wake behind our boat, so we stopped and jumped off the back of the boat. 2. We were not chasing the dolphins. Not even Michael Phelps can chase these animals down. You cannot chase a dolphin in a mask, snorkel and fins. Compared to dolphins, we stink at swimming. 3. If they were feeling threatened by us, they would have been long gone before I even had my face down in the water. 4. These are the kinds of experiences that make anyone appreciate these animals more, and want to protect them and their environment. I know it seems odd that we were able to catch them both, but on two separate dives. How do we know we got the right one? These fish don't travel far within the reef, and we didn't see any other of these species in the area we were. So it was a good find, and lucky that we caught the female on the second dive. If we hadn't we would have had to put the male back. When I was taking this picture the male was being very shy at first, but then kept getting closer and closer to my legs. When it got close enough for me to see his teeth I decided I had enough pictures. I don't know if he was going to bite me, but I think I'd bite me if I were a fish, especially if I was defending my territory and my mate. I know Deb said something in an earlier blog about a possible Barracuda feeding. What Deb and I are now learning is that the Barracuda are picky eaters, and can go weeks without food. Sooooo ... we'll keep you posted on that. Tomorrow we're planning a night dive so I may not get around to a post. I needed to say that mostly so that my mother doesn't start worrying about my safety when she sees I haven't posted anything for the day. Knock on wood, we have not had any major safety situations, only a close call and a few dive related injuries. For the following stories I've change the names of the subjects to protect their privacy...and pride. In this picture Bruce is giving us the "o.k." signal, however he is clearly not okay as his wife Samantha is about to descend onto his head. Not a major safety infraction, but you ALWAYS want to look to see what is above and below you. Hitting your head on the boat is not good. You could hurt your neck or knock yourself out, but most likely you'll panic, putting yourself at greater risk. (Yes, I know this from experience). Crash landing on a head of coral is also not good. It means you just wiped out a whole city of coral. Water and rubbing on skin never mixes well, so most of our injuries have been wet suit related. Lindsay got a major abrasion on her neck from her wetsuit, and two of us have identical cuts on our feet...because we have the same booties with a poorly placed seam. One other person has had an allergic reaction to something in the water that got smooshed between her skin and wetsuit.